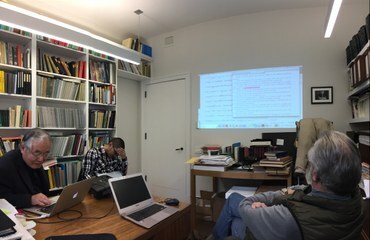 Yesterday I was invited to Prof. G. Kimura’s (Sophia University) Esperanto class at TUFS to talk about my experience of language learning and how to gain fluency in a foreign language. A few years ago, I wrote an article titled “Kiel fluparoli kaj fluparoligi la aliajn”. It now occurs to me what the biggest problem of foreign language learning is and why the teachers avoid talking about it — that is, mistaking non-comprehension as a process to be avoided. To gain true competence in any foreign language is to be at a certain stage fully immersed in the foreign language environment. This entails an unknown but necessary period of non-comprehension. After the mastery of basic grammar a good instructor or a smart student should create for themselves such environment. Most students fear such situation because they thought they are not understanding and therefore not learning (and teachers have nothing to teach as well!). But this is precisely the moment when one gains true competence, just as any other skills in art, music or sport. The best analogy is boiling water in the kettle. One just have to sit there and let the fire do the work. The Asian teachers have to let go of the hand-holding! The transformation from non-comprehension to comprehension requires active participation of the learner. If the student resorts to explanations, drills and tests constantly from the teachers or the books, not only do they become distracted, the superficially useful instruction become an excuse for not participating in this vital process, like taking the kettle away from the fire to check on the temperature all the time. My experience of learning over 20 languages during the past 30 years: Lengthy classroom or textbook learning, though useful and even fun, rarely translates to success or mastery of a foreign language. Success often comes when I had the (mis)fortune and courage to be stupid long enough to let the magic happen. The Gārgīyajyotiṣa is thought to be one of the oldest, if not the oldest astronomical/omen text from ancient India. The work has been considered an important authority on the astral science from as early as the time of the Mahābhārata. Western scholars since the 19th century have noted its importance but no one has yet completely edited and studied the text. This prompted David Pingree a few decades ago to call the editing of the Gārgīyajyotiṣa as a task “most urgent”. I have recently presented an academic paper titled “Tithikarmaguṇa in Gārgīyajyotiṣa – Tithi worship according to a number of early sources” which shall be published next March (2018). I discussed the concept of tithi as presented in the Gargasaṃhitā, possibly the earliest reference to tithi in our extant Sanskrit source. I also revisited Neugebauer and Pingree’s idea that tithi comes from Babylonia. The questions whether there are Hellenistic and Babylonian materials in early Indian jyotiṣa and to what extant they influenced later Indian astral science cannot be settled until the text of Garga is properly transcribed, edited, translated and studied. Currently, I am planning a trip to India this coming January, 2018, Ito collect the key manuscripts in Calcutta, Varanasi, Bombay and some other archives in Rajasthan and Gujarat. Beside Garga, I hope to find more Yavana manuscripts hidden in archives and monasteries throughout India. I hope there will many scholars, especially those from India will attend this important event, especially in our section where we hope to hear about the latest works from the frontier research in the ancient history of science – medicine, astronomy, geology, chemistry in India. 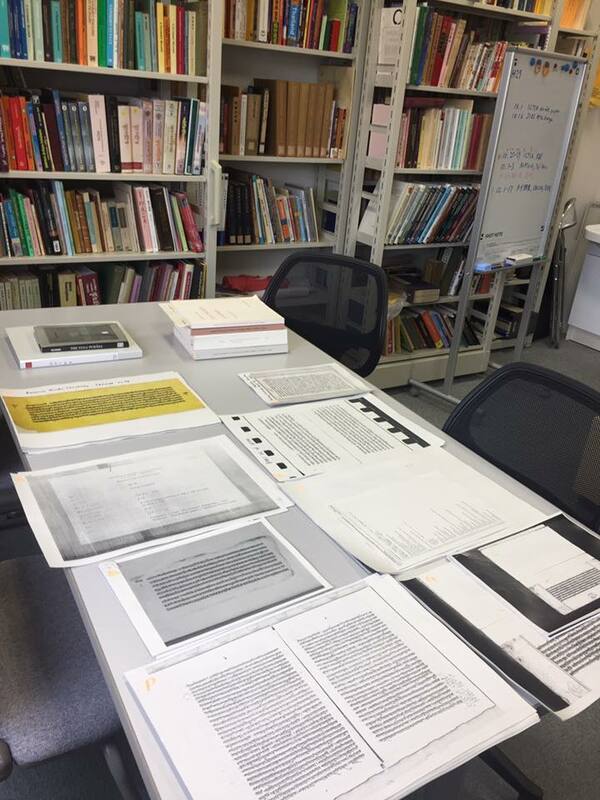 Here is my workbench at my Kyoto office where I am putting together a critical edition of the first few chapters of the Gārgīyajyotiṣa, with eight manuscripts I have on hand: A, Bh, E, F, G, H. M, P. Very exciting work! The Sanskrit is rather corrupt and Pingree was truly not at his best when it comes to the editing of this text. At any rate, I managed to trace some interesting parallels for the various “ariṣṭa” omens in the medical section of the sixteenth century encyclopedia Ṭoḍarānanda. I can’t quite seem to find any parallels in the more mainstream Āyurvedic texts such as the Caraka or the Suśruta. It is quite remarkable that Mīnarāja attributed the materials to the Greeks. It would be very interesting if the Hellenistic sources could be identified. The next section deals with dream omens and the materials seem to bear certain resemblance to those found in the Atharvavedapariśiṣṭa, which Prof. Yano translated but remains unpublished. Prof. Yano and I plan to read through to the end of the Vṛddhayavanajātaka, before I start editing the Gargasaṃhitā sometime before the end of 2017. 64.1 [As explained in the previous chapters,] all the auspicious and inauspicious [effects] resulted from the planets should be understood with good understanding. Now, I shall speak for the sake of the dull-witted (jaḍātmakārtham), with bodily signs and the bird omens. 64.2 If a man does not see by the way of the sky (dyumārge) the wife of Vaśiṣṭha (i.e., Arundhatī, or the star Alcor), the ones eminent in learning (paṭhanapratāpāḥ) predict that he will live up to six months. 64.3 If one does not see the Pole Star (dhruvam), the Sky Lord (ambareśam) and the faint star (kṣititārakam, i.e., Arundhatī), that is, the steps of Viṣṇu (viṣṇoḥ padāni < viṣṇoḥ padāntam), the very poor man whose strength is spent (ākṛtaujā) and whose mind is lost will live for two years (abdadvibhir [sic] < abdadvābhyām). 64.4 If one sees in a clear sky (vyabhre) the “house of the mother” (mātṛgṛham? ), falling meteor (ulkām), Saturn (? ), and a dull Full Moon, then [the person] will life for half a year. 64.5 If one sees an eclipsed Sun (khaṇḍabhāskaram), a lusterless [Sun] or [a Sun] struck by a fiery phenomenon in the sky (ulkayā), he will live for three days. 64.6 If one sees a rainbow (śakrāyudham) at night and stars with light during the day, such man will live for a month in this world without strength. 64.7 If a person sees a crow, a cat, or an elephant, a snake, a lion, a monkey or a jackal in heat (surataprasaktam), he will live for two months in misery. 64.8 If a bull, a peacock (barhis<barhi?) and a cow are seen drinking on their own (? ), or if a cow drinks its own milk, then the man will live for one year and three months, injured by his own people. 64.9 If one sees [the phantasm of] a headless man (kabandham), a demon or a piśāca in the sky, following that, the man would be distressed with his great wealth and live for eight months. 64.10 If an owl makes the choice to be on the roof of the house thrice in the night, one predicts the death of the person to whom the house belongs to be within a year, resulted from acute sickness of one’s sides (adbhutarogapārśvāt). 64.11 If a vulture, a birdling or a pigeon lands on the head of a person, the person would live for seven months experiencing great suffering. 64.12 If foot of a man becomes broken in the mud or when it is placed in the dust, the best of those who know the meanings of the śāstras predict [the person to live] half a year. 64.13 If one sees for a moment a limbless cripple, man[-shaped] born of Saturn, and does not see full or additional [limbs], he would live for a month in this world. 64.14 If a man does not see his own face in the reflection of ghee or sesame oil, [but] sees a limbless cripple, he would live for six months with a severe crippling disease. 64.15 If a man’s mouth has no wounds but is foul-smelling, and if he lives for one year, there will be ruin of [his] caste, [but] he will have a good death, not ostracized [in his caste] (?). 64.16 If a man does not see the tip of [his] nose, part of the tip of [his] tongue or part of his rib (pṛṣṭibhāgam), the great sages, it is predicted by the best of the Yavanas that he will live for a year. 64.17 If the hands and feet of a man after being washed… (vatsahitau?) are completely dry, or if he calls while he was thirsty (pipāsitasyāhavate ? ), he would live for one year and one month. 64.18 If the left part of a man’s limbs and both eyes twitch constantly for three nights, following that he would live for three months, while he was traveling to the lord of [his] kin afflicted by wounds (kṣatārtabandhuprabhum asya yānaḥ?). 64.19 If a man who eats a lot defecates and urinates in a great quantity although he is healthy, he would either live for half a year or dies suddenly. 64.20 If a man creates hostility with friends and makes friendship with wicked and vile enemies, he will live in this world for a year, with hate and anger of gods and the twice-born. Svapnātmakārtham (“meaning of the nature of dreams”)? An emendation seems necessary since the topic of dream occupies a significant portion of the chapter. On Arundhatī as Vaṣịṭha’s wife, see Raghuvaṃśa 1.56, BS 13.6. Cf. Carakasaṃhitā 5.11.5, for death in one year under same condition: saptarṣīṇāṃ samīpasthāṃ yo na paśyaty arundhatīm/ saṃvatsarānte jantuḥ sa saṃpaśyati mahattamaḥ// Also, Aṣṭāṅgahṛdaya (śārīra) 5.33, Suśrutasaṃhitā (sūtra) 30.20. Immediate death is prescribed in two verses attributed to Gopura in Ṭoḍarānanda (Meulenbeld 1999: IIA. 293; see notes on next verse). Cf. na paśyati sanakṣatrāṃ yas tu devīm arundhatīm/ dhruvam ākāśagaṅgāṃ ca taṃ vadanti gatāyuṣam (Suśrutasaṃhitā I.30.20). Note the combination of Arundhatī, Pole Star, and Milky Way. Also: arundhatī dhruvaṃ gaṅgāṃ viṣṇos triṇi padāni ca/ āyurhīnāḥ na paśyanti caturthaṃ mātṛmaṇḍalam // (Ṭoḍarānanda II.5.62). “Persons, who have no pan of life left cannot see the three steps of Viṣṇu, viz., Arundhatī, Dhruva and the Gaṅgā of the sky, as well as the Mātṛmaṇḍala.” Further explanation is given following the same verses: arundhatī bhavej jihvā dhruvo nāsāgram eva ca/ bhruvor madhye viṣṇupadaṃ nābhi syān mātṛmaṇḍala (Ṭoḍarānanda II.5.63-64). “Arundhatī is the tongue, Dhruva is the tip of nose, Viṣṇupada is the mid-point between the two eyebrows, Mātṛmaṇḍala is the umbilicus of Viṣṇu. The Gaṅgā in the sky is te path of the gods.” (Dash and Kashyap trans., same for below). I have emended padāntam to padāni to assume the steps of Viṣṇu to refer to the three celestial objects. Related possibly to Mātṛmaṇḍala, glossed by some as stars (tārakā) according to Ṭoḍara (Ṭoḍarānanda II.5.65). Śanaiścaraṃ here is not so satisfactorily. The original appears to be some incidental atmospheric phenomena such as aurora or lightening. ulkāśanidhūmādyair hatā vivarṇā viraśmayo hrasvāḥ// hanyuḥ svaṃ svaṃ vargaṃ vipulāḥ snigdhāś ca tadvṛddhyai// (BS 13.7). “If the Sages should be crossed by meteoric falls, thunderbolts, or comets, or if they should appear dim or without rays or of very small disc, thy will cause misery and suffering to the persons and objects they severally represent; but if they should appear big or bright there will be happiness and prosperity” (Iyer trans.). Anuṣṭubh. The change of meter is unusual. Cf. BS 4.28 for death of a king when a Moon is struck by a meteor. Utpala glossed kabandha as chinnaśirāḥ puruṣaḥ (BS 3.8). ghṛte taile jale cāpi darpaṇe yas tu paśyati/ śirorahitam ātmānaṃ daśarātraṃ sa jīvati (Ṭoḍarānanda II.5.77). Reading unsatisfactory. This verse is possibly related to: durbalo bahubhuṅkto vā svalpamūtrapurīṣakaḥ/ svalpaṃ vā yas tu saṃbhuṅkte bahumūtrapurīṣakaḥ // nāsikāṃ spṛśate vāpi sa yāti yamammandiram / iti saṃkṣepataḥ proktaṃ granthavistārabhītitaḥ // (Ṭoḍarānanda II.5.119-120, attributed to Agniveśa).